Jaylen Veasley, 22, was taken into custody Monday afternoon by Monroe Police on a misdemeanor charge simple battery and felony charge of unauthorized entry of an inhabited dwelling. Per the arrest report, Veasley entered the residence of his ex girlfriend, Montana Miller, after she advised him not to multiple times and encountered cornerback Floyd Connell. Veasley allegedly Connell and swung his fist at him, which prompted Connell to respond in self-defense. Miller and Veasley have a child together. 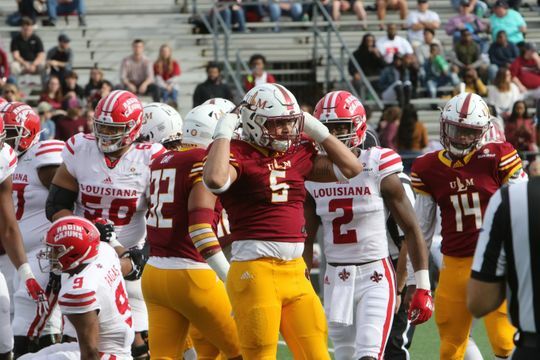 Kerry Starks, a Louisiana-Monroe football player and his girlfriend each face domestic abuse charges following a Sunday morning altercation. Per the arrest report, Kerry Starks, 21, grabbed Abriona Kirt, 26, by the throat with both hands and attempted to drag her out of Hammers nightclub in Monroe by the hair. He also allegedly caused an estimated $400 in property damage by punching out the rear windshield of Kirt’s vehicle with both hands. Kirt was also placed into custody by Monroe Police after police say she pepper sprayed Starks in the back of the head while he was in handcuffs. Both subjects appeared to be intoxicated, per the report. Kirt was charged with domestic abuse battery and placed into custody after pepper-spraying Starks in the back of the head while he was in handcuffs. Starks was arrested for domestic abuse battery and simple criminal damage to property and Kirt faces one charge of domestic abuse battery. Both were booked at the Ouachita Parish Correctional Center. 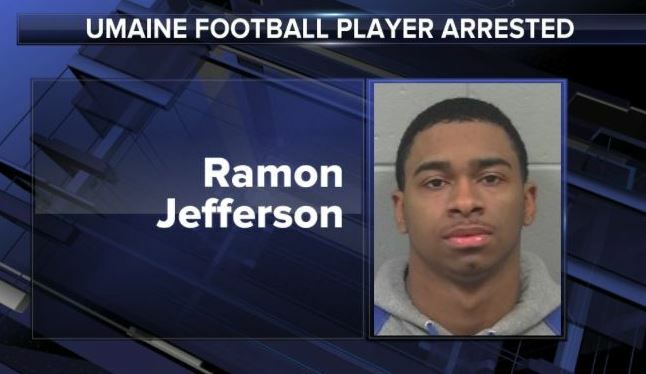 BANGOR, Maine (WABI) – Ramon Jefferson, a University of Maine football player has been charged with domestic violence assault. Bangor Police were called around 6 pm Wednesday for the report of a disturbance. According to a police record, 19-year-old Ramon Jefferson of Old Town had left the home before the victim called for help. Jefferson, who’s from New York, was arrested nearly two hours later by Old Town Police. He’s a sophomore at UMaine and a running back for the Black Bears. Jefferson, who’s also charged with criminal mischief, is free on bail. He’s due in court on March 4th. UMaine does not comment on student conduct proceedings. Missouri sophomore defensive end Tre Williams was arrested Sunday morning on suspicion of second-degree domestic assault. MU Tigers football coach Barry Odom has suspended him indefinitely. Lere Oladipo booked on preliminary charge of domestic battery. 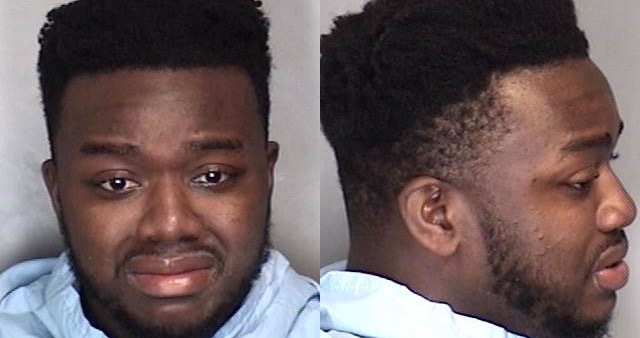 Per information obtained from University of Illinois police department spokesman Patrick Wade, Oladipo, 20, was arrested at 1:03 a.m. Sunday in a University of Illinois parking lot in the 100 block of East Peabody Drive. Police initially were called by someone who heard a woman screaming and observed a man, later identified as Oladipo, forcing her into a car. The arriving officers observed that the woman had a minor injury to her lip. Oladipo was then arrested and taken to the Champaign County Jail. 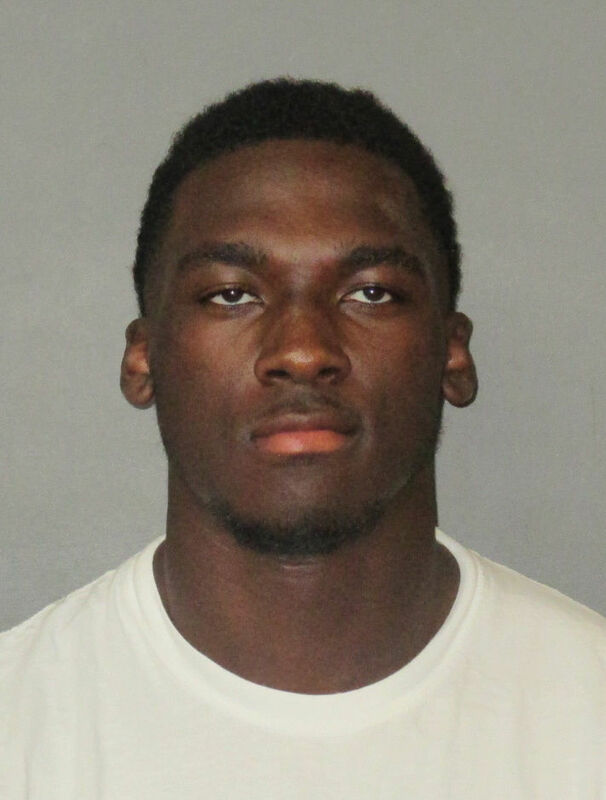 Drake Davis, an LSU football player, is accused of punching and grabbing his former girlfriend by the throat on multiple occasions was arrested Friday, as authorities investigated shifting accounts of what happened. Gator wide receiver Justin Watkins has been arrested in Gainesville and faces four charges( two felony counts) including two counts battery, kidnapping/false imprisonment. and domestic battery by strangulation. According to the arrest report, on July 20th, Watkins intentionally struck a woman, both with an open and closed fist on both sides of her head while he held her down on a bed. The report goes on to say Watkins choked the woman multiple times while continuing to pin her down on the bed. Police say Watkins then confined the women to his dorm room by standing in the doorway and blocking the exit. The report says the woman was physically restrained by Watkins until she sprayed him with mace out of self defense. Police say Watkins then chased the woman out, threw multiple items at her including a brush and container of “hair grease” causing bleeding and swelling. The Gators have suspended Watkins indefinitely. This is Watkins second arrest of the offseason. 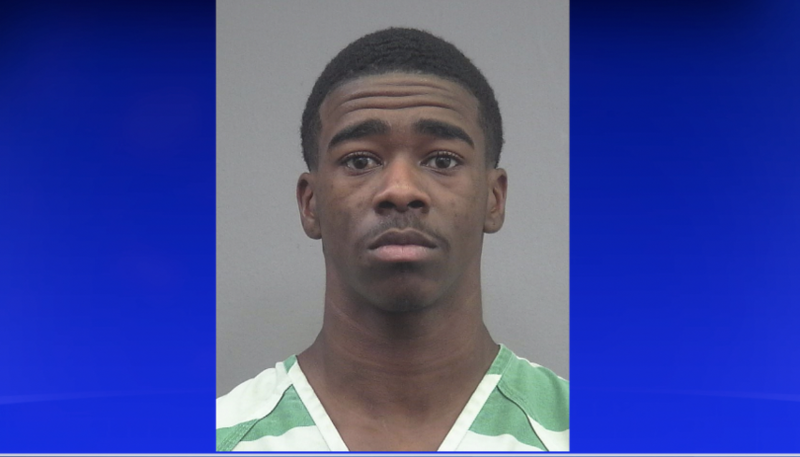 He was charged in May for trespassing near Vanguard High School after following a woman to a gas station, destroying her phone, kicking her car. USC wide receiver Joseph Lewis was arrested on a felony domestic violence charge Wednesday night after an alleged altercation with a woman at a Los Angeles residence. On Thursday, TMZ Sports reported the woman fled the home and called police, who later arrested Lewis. He was taken into custody on $100,000 bail. In February, Lewis was arrested on five misdemeanor charges related to a domestic violence case. He accepted a plea deal that saw him serve 21 days in jail. No further information about the altercation was immediately released. Lewis was suspended indefinitely from the Trojans’ football program following the February arrest. 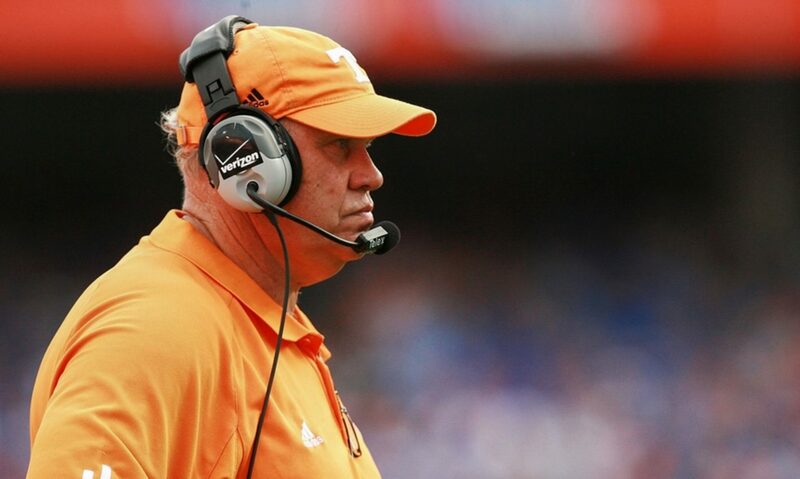 He told the Los Angeles Times in May that he was hopeful of being reinstated for fall camp, which is scheduled to begin Aug. 3. The L.A. native was a 5-star prospect and the No. 31 overall player when he committed to USC as part of the 2017 recruiting class, per 247Sports. 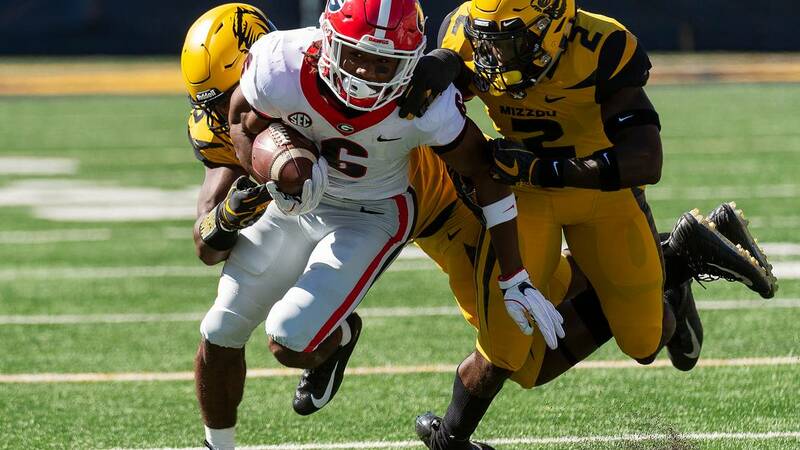 He made four catches for 39 yards and no touchdowns in 11 appearances as a true freshman. 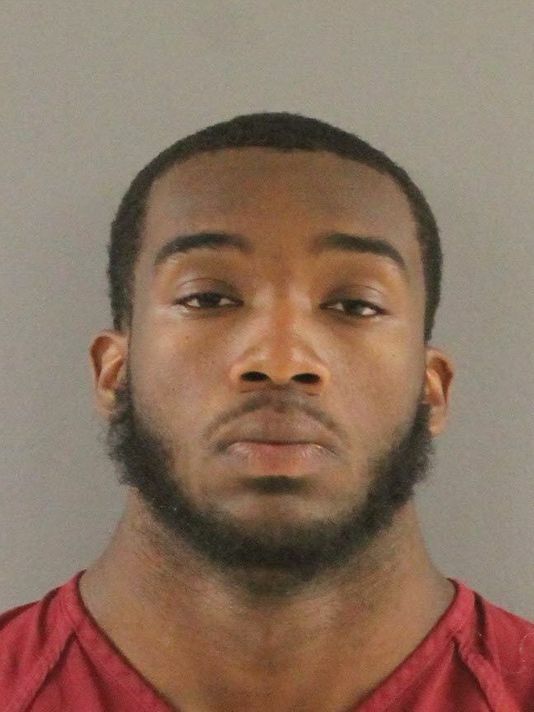 University of Tennessee football player Ryan Thaxton was suspended Monday after a Sunday night arrest. 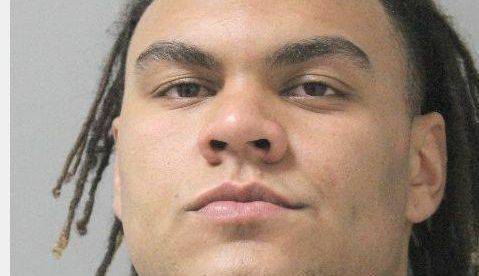 The second-year defensive lineman was charged with domestic assault and false imprisonment of his girlfriend, according to online court records. According to online court records, Thaxton is accused of pushing his girlfriend toward his room when she refused to accompany him to his dorm. Thaxton then carried her inside the dorm room, where an argument took place, and he blocked the door when she attempted to leave, according to records. 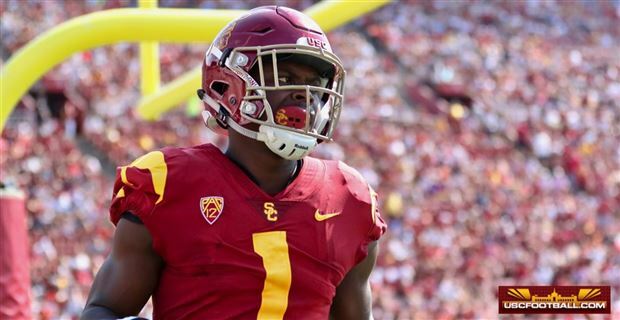 Former five-star WR and freshman Joseph Lewis was arrested on a domestic violence charge Monday afternoon per an arrest record obtained by USCFootball.com. A LAPD spokesperson stated that Lewis was booked on a 273.5 (a) PC charge, which is defined as “corporal injury on a spouse or cohabitant.” A corporal injury is defined as a domestic battery that leaves a “visible” injury on the victim. The charge is listed as a felony on the arrest record and carries up to four years in prison if convicted.